Rosalie Summerton is Artistic Director at Art Angel, and made me feel very welcome at their centre in the city. At the start of a day in which I took part in two classes and chatted with artists and others involved in the project, I sat down with Rosalie for an introduction to the work they do. Trained as an artist, she became especially interested in working in community with a wide variety of different groups. 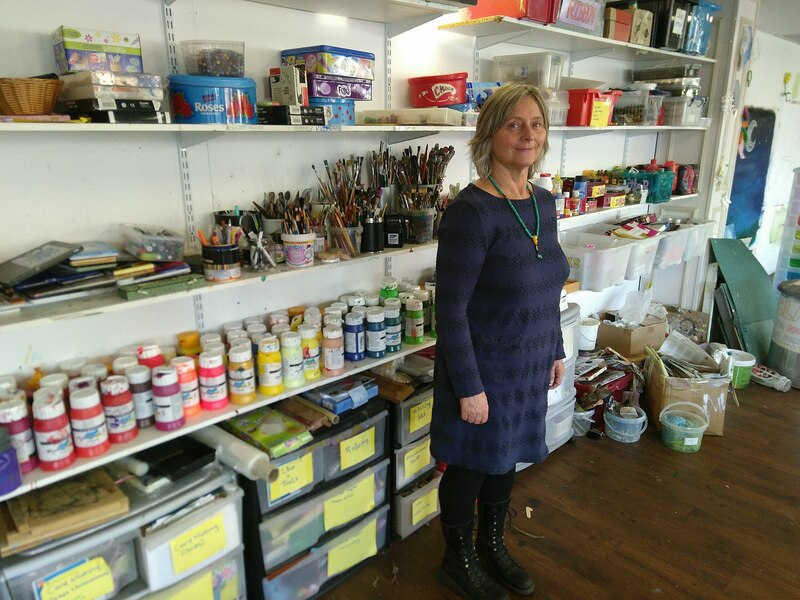 She found herself working for Artlink Central, with people with mental health issues, and realised she’d found her passion. When she saw a job advertised at Dundee Rep Theatre for a project called ‘Art Advocacy’, she was curious and applied. Over time, as you’ll hear, that project evolved into Art Angel, and she has been there ever since. Art Advocacy began as an exploration of how to empower people to develop a voice in the community through art. I started by asking her how over the past few years she has noticed the impact of government-imposed austerity in Dundee, and on the people walking in through Art Angel’s doors. “Definitely. Definitely. Dundee is the ‘sanctions capital of Scotland’. We see a lot of people really struggling with the whole benefits thing since it changed, and the lack of support for people and the feeling that when you go for the interviews that basically you’re lying and that you’re not trusted, that has grown and become a massive issue to the extent where we actually have Citizen’s Advice Bureau coming here now to meet up with people who are struggling, here on the premises. Yes, there is a greater number of people presenting with mental health issues of all kinds. Anxieties, depression. All sorts of things. Obviously there’s an increase in young people. So we’ve responded. We’ve got young people’s groups. We’ve got young men’s groups now because young men are particularly susceptible and there’s a lot of suicide amongst young men. Basically we need more projects doing more work like this. Obviously not everybody’s interested in art, but we need a wide range of different things for people to get involved in in the community. They’re just not there because the money’s not there. So, yeah, we’re seeing more people, and obviously we have a limit to the amount of people we can take. Especially since we want to keep this place with the ethos that we have, which is one of a very friendly and an easy place to be for people. If we overload that with people, we won’t have that. We want to know everybody’s names, we want to be able to talk to people. And if we just start taking thousands of people it will just change the whole way this place works. Rosalie Summerton. And some paints. When people are feeling very isolated and anxious and depressed, what is it that art does? How does art help? Well obviously, first of all, when people are struggling with anxiety, or any mental health issues, communication can be a major problem. Art provides an alternative way of expressing yourself. It’s not art therapy necessarily in that people come and paint their problems. Some people do paint what’s happening, or some people write about it, or some people take photographs and align it with that. But most people we find, in actual fact, want to have time away from their issues. This place provides a safe space to do that. You don’t have to think about anything. Nobody is judging you. You can be relaxed. You can develop your art work and your skills. You can learn new things. You can share your skills with other people. People are coming from all walks of life, so everyone has got different things they can bring to Art Angel and share with other people. That happens all the time, and that includes support for mental health issues. It’s not the kind of place people sit around and talk about their mental health issues all the time. But if people want to, they can. That’s the good thing. There’s no pressure to, but you can if you want to, and someone will listen to you, and give you that time and space to explain what’s going on. It’s not that we give loads of advice about what we think you should do. It’s more that we just do listen and give you that space to tell us what’s going on. Obviously we can refer people on, but it’s very limited as to what you can refer people to now. Because even things like psychology or therapies, you’re talking about a year, a year and a half wait, you know. That’s not good enough really. Art Angel’s base in Dundee. There’s a lot of failings in the system, and that’s the other thing, because the mental health system here is failing it means that people aren’t getting that initial time with the services to maybe settle to a point where coming to a place like this they could get a lot from it straight away. We’re really having to do that first bit of work ourselves so we’re seeing people in a lot worse situations than we were maybe about 8, 9 years ago. People were coming a wee bit more settled to start with because they had spent time with the services and that had helped, and now they’re just coming. They’ve had the services for two weeks or something and somebody spoke to them a couple of times and that’s it. They’re coming to us still very unwell, so we’re having to deal with that a lot more. We’re having to deal with things on a weekly basis that we’ve never dealt with before. It’s a real challenge, but we’re really interested in people, and seeing people getting well and staying well. And they can do that by using art, and they can do that by using art as a transformative tool. It’s a place you come and you’re not bipolar, you’re not depressive, you’re not this or that. You’re actually an artist. You’ve come here, and now you’re an artist, and you’re working on your piece of art, and you’re learning things and you’re thinking about what you’re going to do next. And you’re learning about other artists. You’re going to exhibitions and you’re just building up your interest and your passion for art. A new identity I guess? A new identity… That is exactly the transforming part of it, that it is a new identity, because we very much believe here – this has come through the people who we work with – that recovery isn’t about regaining what you had before. The reason you got ill, quite often, is because you were doing things before that made you ill. To go back to that just seems pointless. It’s about developing a new life, and new things that are going to help you keep well, stay well, and have an enhanced life. Not just maintain yourself, but actually get some enjoyment out of life, be able to contribute to things, be part of something, be part of a community. Art Angel achieves that really well because people have told me that it has. That’s the way we work. We say, “What do you think?” We just had – in fact, you would have enjoyed that, that would have been a good time to come – we had a Creative Evaluation Day which we have every couple of years, where everybody in the project comes on the same day. It’s total rammed and we have workshops and we have many different ways of people feeding in what they think about the project, but mostly using creative means. At a ‘Creative Evaluation Day’, artists were asked to chose images to go inside a shape of their heads, to show how they were before getting involved in Art Angel and afterwards. They’re doing things that they would normally do, or they’re maybe trying something new. Maybe they’ve never gone to creative writing. They think, “Oh, let’s do some creative writing today” and it generates an awful lot of absolutely brilliant material that we can use. We then can create this evaluation paper which just has a mixture of visuals and information that comes straight from the people who come here. At the end of it we produce this action plan, which is things that we need to change, or do, or improvements. Then we do those. It’s great. I have to say we’re pretty lucky because most of the improvements and changes revolve around things like loo paper and stuff like that. Biscuits. As ever. It gives us a chance to see what people are thinking about what we do and how we do it, because we want to do the best we can for the people who come. The only way we know we’re doing that job okay is by asking them. That’s why we get very frustrated when we get asked for a scientific statistics and all sorts, because really people’s personal testimony to me – if someone says this is helping them – why wouldn’t I believe that? It just makes sense. I wonder if you have any stories or any reflections on when people come in and they’re very anxious and very depressed, how that is for them at that time? And then how you’ve seen going through this process change that, or affect that? How does it affect their ability to think positively about the future? Most people that come here initially can hardly look you in the eye, to be honest. They’re broken. They feel quite often as if it’s their fault, that they’ve done something wrong, and that they’ve ruined their family. They’ve lost their friends. There’s a lot of loss involved. They just don’t think anything of themselves at that point. It’s very hard. That point is so important for how our workers work. The staff are essential in this whole game, because if they’re not good, then the whole thing wouldn’t work. We will spend time with that new person just finding out what they’ve been doing before, what kind of things they like, what they’re interested in. And on that first day, we’ll just spend time with them and make sure that they feel like they’ve got something. We’ll make sure that they create something on that day. That’s really hard for them to do, because they’re in a brand new place, don’t know anybody. It probably seems like everyone else is painting away and they know what they’re doing. It’s quite daunting. But usually we find that we can somehow, and it’s hard to describe how, get that person on a bit of paper, or on a canvas, or with a piece of clay, doing something. That’s always great because then they feel like they’ve achieved something that day. Quite often we’ll say if you find the two hours too much on the first day, don’t do it, but everybody stays the full time. Most people will tentatively start to say hello to their neighbours, and there’s other people in the group that are naturally good at peer support, who will come over and speak to them and show them around, and make sure they know where all the materials are and stuff. We go from there, because what people are doing is working on their own projects. It’s not a case of we say, “today we’re all doing so-and-so and this is how you do it.” We’re encouraging people to take control right from the start, and say, “No, I’m interested in manga, for instance.” We’ll get all the manga books out and we’ll just encourage them to look at the books and maybe come up with some ideas and tentatively start doing some drawing, and from there they start to build up their own project. What’s great is that they will stick to the thing that they may have done in the past, even if it was at school years ago, in the beginning. Then I can assure you by six months later they’ll be doing something radically different. They’ll be painting on canvas, they’ll be doing some big sculpture, they’ll be taking themselves well out of their comfort zone into a whole new plane because they feel safe to do that here, and because we’re so based in the process as well, the process is therapeutic. The process is when people are concentrating on their piece of art, their using their brain to make these decisions almost unconsciously and they’ll be away in their own wee world for hours and everything else is gone. They’re just focused on what they’re doing, and in between times they’re having chats and cups of tea, but then they’ll focus back in on their piece of work, and the time will have gone like that. Whereas if they’d been at home, it would have seemed like hours and hours and hours. It’s that therapeutic engagement with art, with materials, the physical holding charcoal, getting paint on your hands, clay, all of that. It’s exciting. And we just find after six months people are beginning to go, “Maybe I can try this, maybe I could try that. Never done that before. What do you think?” And we’ll go, “Yeah, why don’t you try it?” And people will, and of course, it’s not always successful. And it’s trying to say as well that because it’s a process, it’s never going to always be successful to you. But at the same time, you’re always learning something new from everything that you do. And you can see – and that’s another thing we do – at some point with a new person, maybe into the six months, we’ll take all their work out and have a look. And you can always see how they’ve developed. And then they go, “Oh wow, I didn’t realise” and that’s so encouraging. That’s what I love about it. There’s no parameters. But of course we do have to battle with the fact that a lot of people have a very set idea about what art is. They’ll maybe come in and say, “I really want to learn how to draw so and so”, so you’ll maybe set up a still life for them, knowing what’s going to happen. And of course they’ll be really disappointed because they can’t draw it. And for some reason people seem to think that you can just draw, or not draw and we say to them, “Well, really, if you want to learn how to draw, you really have to do that every day.” It’s something you have to work at. It’s a skill that you build up over time. Some people will just keep at it and you can see their skill building up. Other people will just start going off on their own tangents, which I like, because that’s far more interesting because that’s their own ideas coming out and it’s almost their own soul coming out in a way. It’s their energy and their ideas I think are far better than trying to do the old days art college-y still lifes and drawing that way. Would you give them formal art instruction? Yeah, we can do. We can. All of our tutors are artists. They’re all trained at art college so they can do that. The majority of people move away from that though. They do, because it’s a wee bit boring actually! And quite a lot of work. Yeah, once you’ve learned the skill, you’ve learned the skill. But as I say, most people will take off on a tangent. Then maybe a year into things you really again see changes where people feel comfortable here. The whole thing is for people to start taking control of their lives again. It is a wee bit different now because previously – maybe 10 years ago – a lot of people we were seeing were coming out of hospital. They’d been in hospital for large periods of time. There’s still a lot of people going in and out of hospital, but nobody stays for long these days. You’re in and you’re out. They were far more used to, you know, a bell rings, you get your medication, a bell rings, you have your lunch. You’re disempowered completely. Whereas now it’s not quite the same, but we still have people coming and asking us if they can go to the loo, if they should use a colour or not. We’re just trying to encourage people, to say, “You can make those decisions. Trust yourself. You can do that”, and they’re responsible for their art space, cleaning up, doing all that. Everything they do here they’re responsible for. That’s really good because that helps confidence as well. You start to realise you can do all that stuff. A lot of folk had jobs and stuff in the past as well. They’ve had lives before where some of them had big responsibility. It’s good. All of those little things start to make a difference to a person and after time you do see them, as I say, getting much more confident. Really developing their art and getting so excited about the art. Some of the stuff that comes out is amazing. That’s why we have frequent exhibitions and things as well so we can get the work out there and in the community and show people what we’re up to. We’ve had young people showing films and then talking about them to the public. That’s been really good. Just taking things further. We have regular groups happening all the time so there’s continuity. You know, certain time, certain place, you’re there, here, this week, but we also have one-off projects where we’re working with other art organisations. Bringing people in, or other artists in. We had one last year called the Universe project and we were working with McManus Gallery and we were working with a science fiction writer who came in for a short period of time and did a load of science fiction stuff, and we were going to the Observatory in Dundee, looking through the telescope, and the theme was Universe, and it just went off on a tangent, the theme. We ended up with a fantastic exhibition and a fanzine. Lots of one-off projects taking people into places we don’t go, like doing print-making. We don’t have the facilities to do some things here, so we’ll maybe take people who do things outside here, or bring an artist in specifically to do something. It’s taking people, giving them a huge range of different opportunities really. If you had been elected as the Prime Minister of Scotland and you had run on a platform of ‘Make Scotland Imaginative Again’ – so you felt that actually this was a time, maybe more than any other time when we need people to be at their most imaginative, to be able to figure out ways around the big challenges that we have – so you came into office on this thing that we need to focus on building the imagination, whether it’s in politics, in education, all through the life of our society, where would you start? What would you do in your first 100 days? I’d probably start in education, because you want to start with people when they’re very young so that it’s part of their lives forever. It’s something that they’re doing and feel part of right from the beginning. Because that’s one of the things, obviously with the V&A being here, there’s been a lot of discussion about £86 million gone from local money to the V&A, yet there’s all this poverty and difficulty and drugs and all these things happening to a community that’s the other side of the Kingsway, which is a big road in Dundee, so it’s not visible. That’s one thing about the years previous when I did work in community. There was a lot more money around to work with people in places like that. You could get people excited about art everywhere. People who maybe never even thought about art began to get excited about art because it was there, you could work with people, whereas now it’s not visible. I would start with young people, straightaway. And they’re the future anyway. They would take that into the future as well, right from the word go. And that would filter into everything we do because I don’t think schools are very imaginative at all. I don’t think they’re creative. They’re there to make little workers and I feel quite strongly that there is a whole bunch of people in society who are forgotten and not cared about. And now, even demonised. Everybody else thinks they’re terrible. I think that’s a terrible, terrible thing. I mean, how you would do that, I really don’t know. You’d have to have really amazing people working in these areas that could bring that excitement and bring an idea of what imagination is. Because it’s almost been stultified. It’s almost stomped on now, to have imagination. You’re not supposed to have imagination, you’re supposed to do what you’re supposed to do. I find that in workplaces as well. That’s another thing that really gets me, is that in workplaces there is this terrible bullying thing going on throughout people’s work and it’s accepted, instead of looking at what people’s strengths are and saying, “Hey, you’re really good at that, why don’t you do that, and this other guy’s really good at that, and then you two could work together and use your imagination to build this incredible future.” Instead it’s just, no, you’re expected to do everything and if you don’t do it, you’re weak and then you’re out, and then you end up here. So that’s another thing that bothers me. When you were talking before you used the word attention, and I wonder – it feels like we’re in the middle of an attention crisis, that everyone’s attention is shot to bits and they can’t focus on anything. I wonder if you’ve seen an increase in that? Yes. Obviously a lot of the people that we’re working with are taking medication and that does affect their ability to concentrate. But generally yes. You know, we’re all attached to our phones. We’re always looking at the phone. Even when you go see a movie, it’s really fast and furious and quick. There’s no pause or time to speculate. It’s always just everything is full on and we feel as if we’re not being entertained unless it is. Attention spans have definitely gone shot to pieces. Mine is, but that’s because I’m dyslexic anyway. I do find it quite hard to focus sometimes. But we are seeing a lot more people who are just finding it hard to focus on things. Tomorrow morning I’m going to go and have a look at the V&A Dundee, and I heard about your project because there was a programme on Radio 4 that was about the V&A and about you as well. In terms of if you want to rekindle a community’s imagination, is building an enormous multi-million pound thing a contribution to that? Is it a distraction from that? What’s your sense of the impact that that has had? No. I don’t really think it is, I’m afraid. There’s been a very good response by the public and they’ve gone round talking to all sorts of people. Generally people are quite excited about that, but of course if you went up to Whitfield or any of the areas in Dundee which are impoverished and struggling, I don’t think they would say the same. They would say how come that money didn’t go into helping us? Again there’s that sense of being left behind. We need to put much more money into working with people in these situations, doing all the different things we can do to help them to realise that they aren’t rubbish. That they’re just as important as everybody else and that they have huge things to offer. And given the chance to do that, they would. But I get the sense that it’s almost like, well, they’re up there. I mean every city’s got it. The difficult bits are outside town so we don’t need to think about that. I know there is a lot of good work going on, but it’s not enough. It’s just not enough. Putting a big patch on it like that is not really fully the answer. I mean obviously for us it’s exciting because we can work with people in a way that helps them to realise that they’re just as open to going to the V&A as anybody else, and why shouldn’t they? And we can go together. They won’t have that sense of going into this massive building on their own. But it is daunting for anybody from our project even to go into Dundee Contemporary Arts, or any other building that’s public like that. There’s still a sense that, “Should I be here?” We try and battle against that all the time. There’s a lot of background work needs to be done before people can go, “Hey, the V&A’s actually alright.” First, naturally they’re going to think, “what a waste of money” because we’re up here in the pits. You can’t help it. You’re bound to see it that way. But if we can understand that actually culture is good, culture is what can help us get through this stuff, and it can help us to be happier people, then our work would be done. But it’s just not happening. It’s not happening to the extent it needs to. The money isn’t there. The support isn’t there. You see it. There’s primary schools in Scotland, many of them don’t have art any more. Or it’s the teachers themselves who do the art, and of course they’ll do it in a way which is, “You get this and this, and you stick them together and you make a nice picture”. But that’s not creative to me. We really do need much more creativity and imagination. As you say, imagination is such a great word. It’s brilliant. They did it with the DCA as well when they built that. That was going to be the answer to everything but of course it’s not. Not saying I’m not excited about it. I am. I’ve been on Radio 4 saying that and I’ve also been on the Skinny magazine saying the same thing because I want it to be good. And I’ve almost given a challenge to the V&A by saying, “You’re going to be doing everything you can to make sure as many people can come here, aren’t you?” So I’m hoping to hell that they do some outreach work, and work with people in a way that’s going to help them see that, yeah, they’re just as welcome as anyone else. I liked this article about Rosalie and Art Angels, what a nice way to give back the self estime for the so called “mental ill” persons. And the pictures are beautifull, and that’s why we say one pictures tells more than an thousand words; Very impressive! I had the privaledge to follow a course ‘ Artibus” in the netherlands with artists as tutors, for people who wanted to develop their artistic knowledge and practice, after working time. Also an eye opener for workaholics! I know ( now) that V&A is the dundee design museum, ( via internet) but what does the caracters stand for? I experienced in my work( in the nineties) a lot of courses about mindmapping, meditation, group processus etc, this should be integrated in our whole society. Im a member of art angel and love it. Everything about this place is amazing.